In this riveting new novel by the New York Times best-selling author of the Chet and Bernie mystery series, a deeply damaged female soldier home from the war in Afghanistan becomes obsessed with finding a missing girl, gains an unlikely ally in a stray dog, and encounters new perils beyond the combat zone. LeAnne Hogan went to Afghanistan as a rising star in the military and came back a much lesser person, mentally and physically. Now missing an eye and with half her face badly scarred, she can barely remember the disastrous desert operation that almost killed her. She is confused, angry, and suspects the fault is hers, even though nobody will come out and say it. 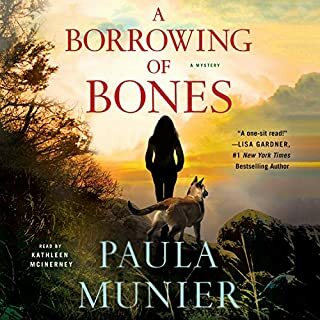 Shattered by one last blow - the sudden death of her hospital roommate, Marci - LeAnne finds herself on a fateful drive across the country, reflecting on her past and seeing no future. Her native land is now unfamiliar, recast in shadow by her one good eye, her damaged psyche, her weakened body. 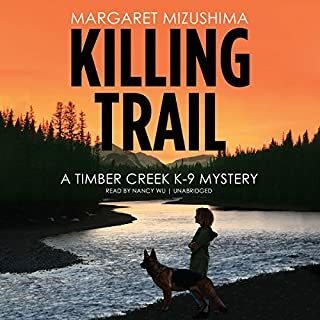 Arriving in the rain-soaked small town in Washington State that Marci had called home, she makes a troubling discovery: Marci's eight-year-old daughter has vanished. 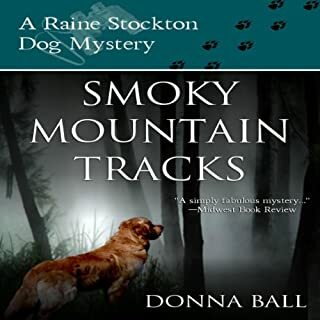 When a stray dog - a powerful, dark, unreadable creature, no one's idea of a pet - seems to adopt LeAnne, a surprising connection is formed, and something shifts inside her. 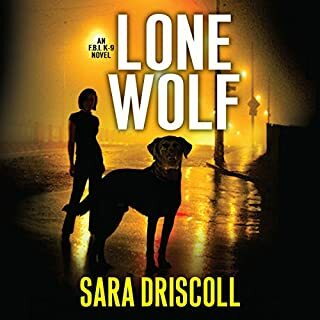 As she becomes obsessed with finding Marci's daughter, LeAnne and her inscrutable canine companion are drawn into danger as dark and menacing as her last Afghan mission. This time she has a strange but loyal fellow traveler protecting her blind side. 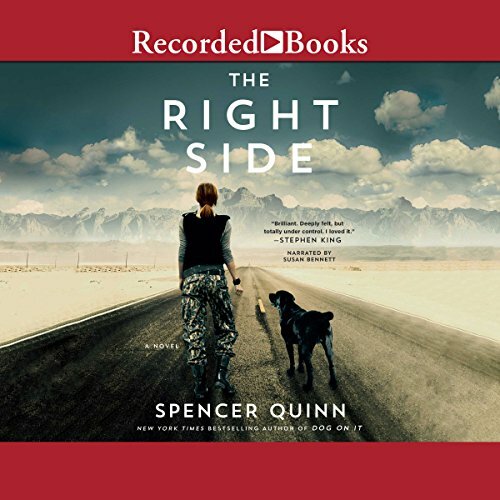 Enthralling, suspenseful, and psychologically nuanced, The Right Side introduces one of the most unforgettable protagonists in modern fiction: isolated, broken, disillusioned, yet still seeking redemption and purpose - LeAnne takes hold of the listener and never lets go. Having listened to all of the Chet & Bernie books, I really was looking forward to this one. It is much more serious with no laughs. However, the characters are beautifully developed and very believable. LeAnne is a Tough & not necessarily loveable person, but you care about her. I am hoping for a sequel. I want to follow LeAnne and Goody on their journey. I have never been in my head of someone with PTSD or injuries from war. This is an amazing tale about what our military endures. And has a mystery too. Mr. Quinn is a brilliant story teller. This isn't a typical who-done- it. In fact I thought it must be for young adults. But I kept listening, telling my inner child to get a grip and I enjoyed following the Sargent. It is a 3 plus for the simplistic writing with a darn good story. Please more of this bad a** woman! She has the makings of a really great series. The book is about the effects of PTSD, grief in general, and the challenges of physical injuries on a strong and independent soldier. 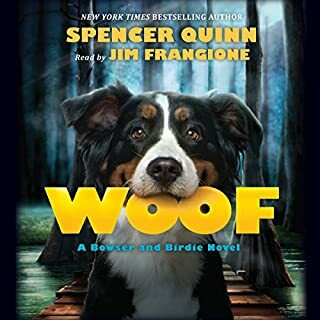 It happens to be about a woman but it could easily have had a male hero with almost no changes, which is a tribute to Mr. Quinn's skill as a writer and understanding as a human being. Scary, funny, poignant with simple language about complex situations. The narration was absolutely five-star. Ms. Bennett uses voices and accents appropriately and without making you think about it too much. A flowing, easy-to-listen-to delivery, serious but not dull tone, and no weird quirks. I love that a dog got involved eventually. I miss Chet. What made the experience of listening to The Right Side the most enjoyable? The narrator is fabulous! Whether she was switching from male to female voice, or from American to Pakistani accents, or just generally conveying emotion, she was flawless. Her voice is pleasant and easy to listen to. The chapter in which LeAnne refused to give the dog to the shelter, and then came to realize that it was now HER dog. I do not suffer from PTSD, but this book definitely gave me an insight to how horrible it must be for the people that do. The author made this character so real, so down to earth and relatable, and I wanted to know what LeAnne would do next, even after the book was over. I HAVE to know! I am hoping that the author decides to do a second book just so that we can find out how LeAnne is now coping, what she ended up doing, how Goody and her relationship continued to develop. Please, please, please!!! I am invested in LeAnne and Goody's life now. I want to see more of it! The Right Side is a tight telling of a journey that has one impossibly riveted to the end. Dark, lingering on disturbing, this story is also deeply moving and curiously uplifting. LeAnne Hogan is a heroine in every sense of the word. I highly recommend this audible. The narrator captures LeAnne in a way that feels just right and kept me in the grip of her voice to the last word. This is my first written review and I've listened to Audible for years. The main character was injured in war and was very like others I have known. She reminds me of Jack Reacher. I am hoping for a series of her adventures. I felt like I knew and cared about her. As an Army chick myself, gotta say, this character is real. Way to go Quinn! Hope to see her and Goodie back at the VA one day. whoa on the f*** word! 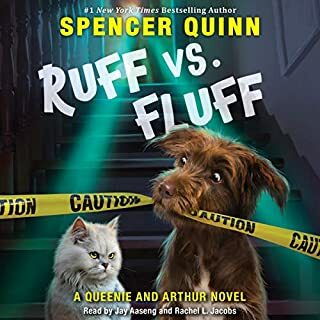 I've listened to Quinn books before, "Woof" the Bret and Chet series, and really enjoyed them. I don't know if I can say I enjoyed this book. HOWEVER what I can say is I could not put it down. I can't recommend it because the language was so very bad. But I cared so much for the characters, despite many things I didn't like about them, that I HAD to finish this book. Oh I am not a total idiot, I know military folks often have really bad language. And brain injuries certainly erase any filter one might have had. Perhaps It is because I too struggled thru vision loss in my younger days and remember my own anger. Perhaps it is because a loved one is going through major brain changes.Anyway, I empathize with this character and really hope she will be back. I hope Quinn will tone down the language a bit, the next time around. My ears are still burning. Susan Bennett was fabulous, as usual. I will order a book simply because she narrates it.